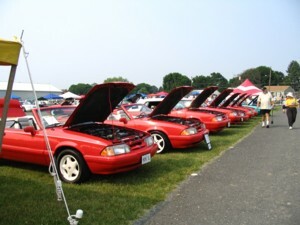 The fourth annual gathering of Mustang LX 5.0 Convertibles is being planned for the 2010 Carlisle All-Ford Nationals held from June 4-6, 2010 in Carlisle, PA. Following, is information that should answer some questions you might have. Read the Carlisle 2010 section of my blog for updates as well as the thread in the forums. For some history from prior years, see below. 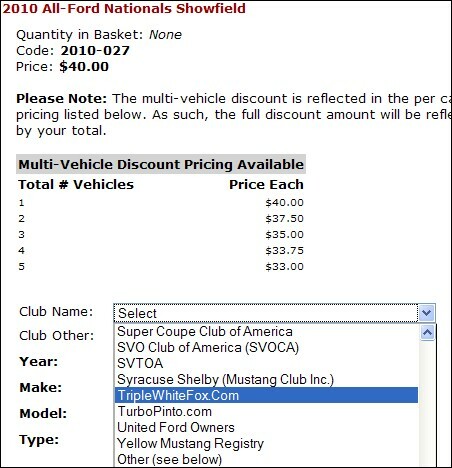 Registration is open for Carlisle All-Ford Nationals 2010. Go to www.carsatcarlisle.com to register. When you register, you will need to communicate to them that you are part of triplewhitefox.com. This will help them to group us together. This year, the registration form has a prefilled list of clubs and triplewhitefox.com is listed. Please let me know once you have registered so I can keep track of how many people are going. As in past years we will be reserving a tent. It has been a key component to having a good time each year. In past years it has kept us out of the scorching heat as well as shielding us from intense rain. Since we do not get the required 25 cars preregistered for the tent we have to pay a fee. This year the cost is $160. I will pay the upfront cost and look to have people who attend help out by contributing $15 each. You can contribute while on site at the event.